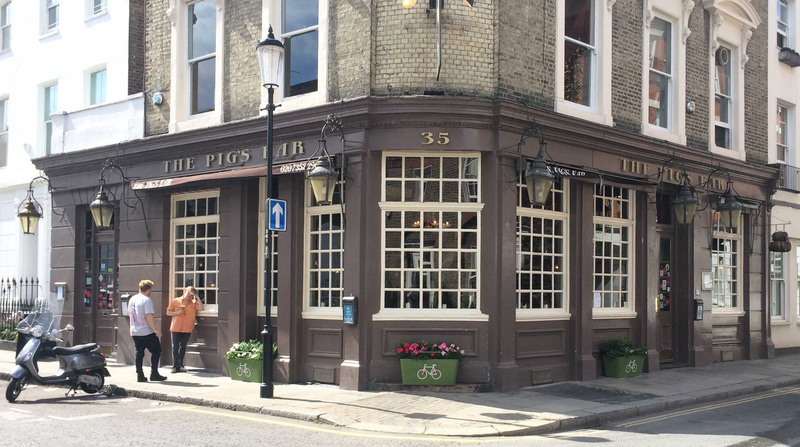 An award winning gastro pub and restaurant; The Pig's Ear is a popular drinking and dining institution in Chelsea with a traditional yet timeless feel. The Pig’s Ear is a popular drinking and dining institution in Chelsea with a traditional yet timeless feel. Delicious British/French brasserie food is served in the bar daily or you may reserve in the adjoining Blue Room which boasts an open fire during the winter. The oak paneled Dining Room on the first floor is open during the busier evenings and weekend lunches for an elegant and attentive fine dining experience, reservations are essential. The menu is changed daily with the emphasis on keenly sourced seasonal produce from quality suppliers. Traditional British cask ales from the nearby Sambrooks Brewery are offered as well as the exclusive signature Pig’s Ear pale ale brewed locally by The London Beer Factory. Orchard Pig cider & a selection of Czech, Belgian and German lagers are also available by the bottle and on tap. The wine list is eclectic with a predominantly French influence and a varied selection is available by the glass.